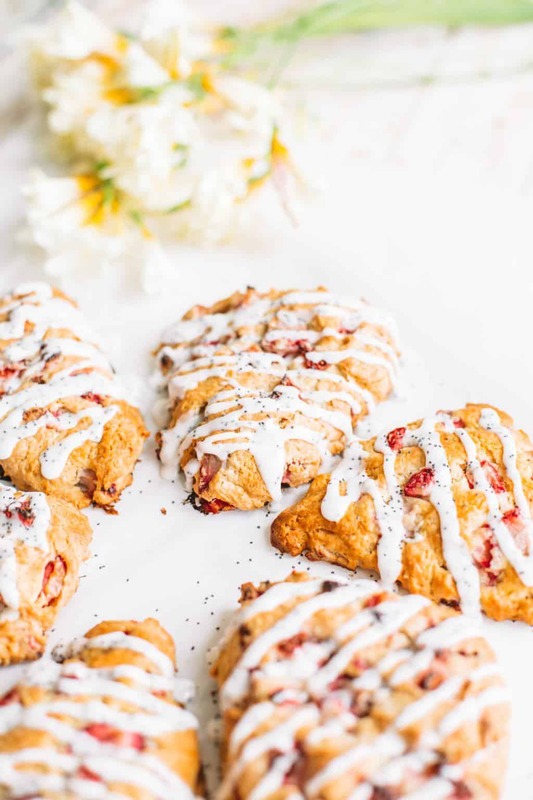 Easy strawberry lemon Poppy Seed scones that are perfect for brunches, Easter, Mother’s Day and more! 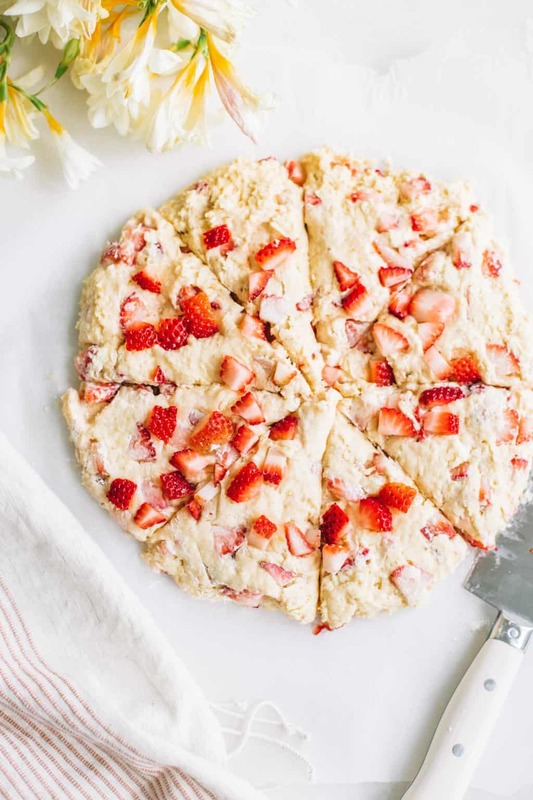 This easy scone recipe is filled with fresh strawberries, fresh lemon and poppy seeds! Hi hi! How was your weekend? I’m usually not one to ‘live for the weekend’ because I pretty much love work days as much as weekend days but the weekends have been exceptionally wonderful lately! 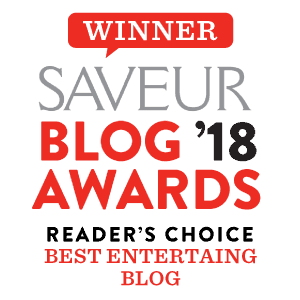 I have these really weird feelings every Sunday night of being thrilled to get back to the blog world but also leave my little weekend world behind. It’s weird but, #goodproblems ya know?! I decided to rent him a Tesla for the weekend! Yes, for real! I know this sounds extravagant but I promise it was really simple and pretty affordable. In college I used this app called ‘Turo‘ whenever I needed to rent a car because I wasn’t old enough to use the regular places like Enterprise and Budget. I promise this isn’t sponsored lolz I just want you to know about this fabulous app that you can basically air bnb fun cars with! If you’re looking to spice things up over the weekend, try it! We then migrated to the couch to watch Game of Thrones. I’ll be honest, I only really watch it because it’s on at our house and Jared’s obsessed. I do find the blonde dragon lady extremely cool and badass. Also, John Snow isn’t so bad to look at. I was catching up on emails and realized we are six days out from Easter!! What are you guys making?! These carrot cake cinnamon rolls will certainly be making an appearance and I’m thinking maybe a fun strawberry champagne sangria! 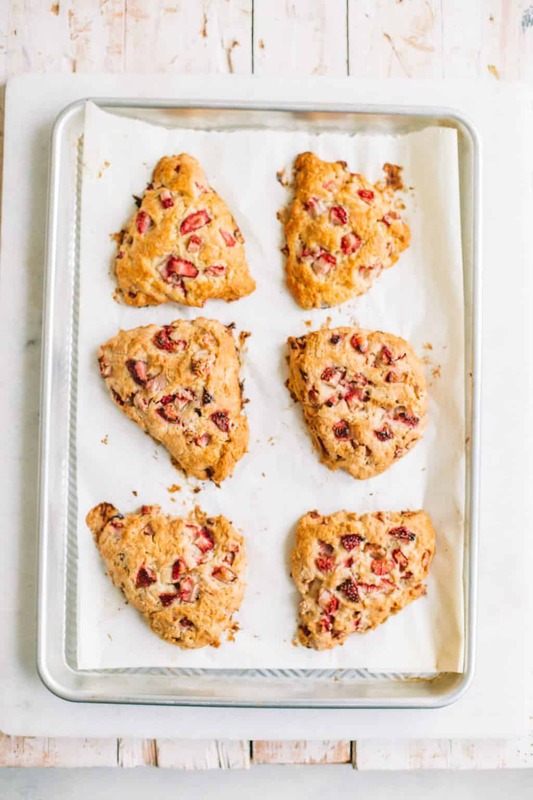 To cover your Easter morning, I wanted to make these easy strawberry lemon poppy seed scones for you! I love these scones because they come together really easily and are oozing with spring flavors. A simple scone or muffin in the morning on a special holiday is my favorite. I love to sit outside with a cup of coffee and have an extra long morning before all the holiday chaos gets started. 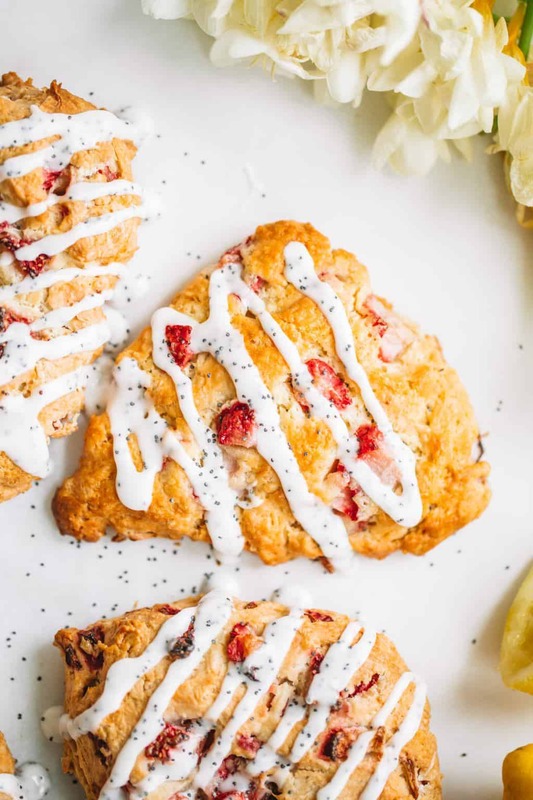 These strawberry lemon poppy seed scones are perfect for that! 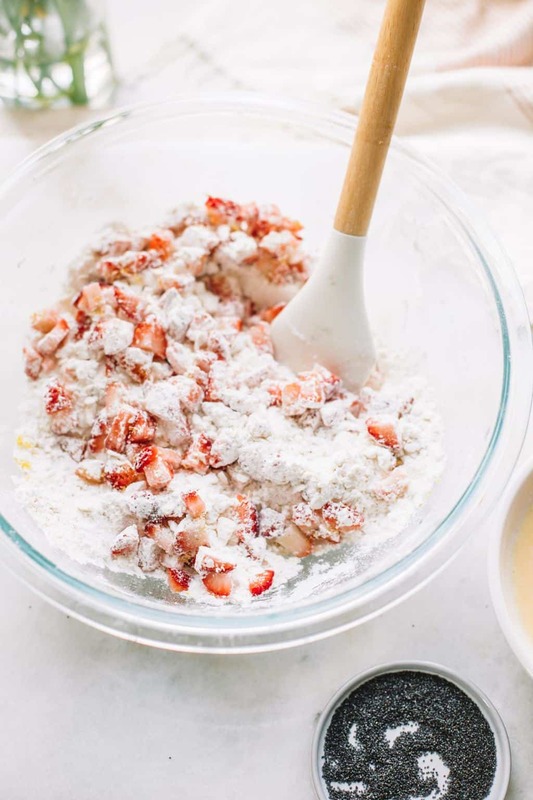 This scone batter is pretty simple! Just keep in mind to use super cold ingredients (mostly butter) for a really tender scone! I like to shred mine into the batter with a cheese grater! 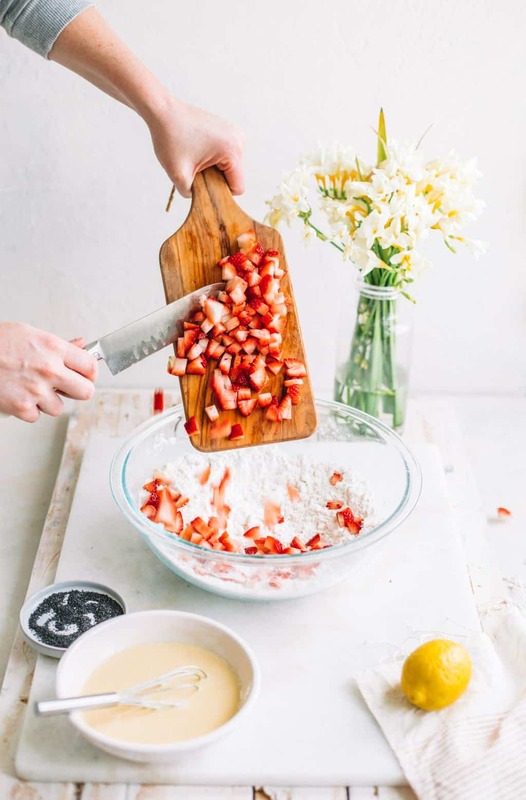 You can swap out any other berry if you’d like, I just think strawberries are perf for spring. My favorite step (that you cannot skip!) 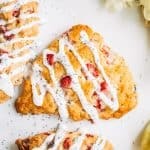 is brushing your strawberry lemon poppyseed scones with heavy cream right before baking! This will ensure an super shiny top that will make your scones look like they just came from a bakery! Last but not least, the less ‘handling’ you have with your scone batter, the better and more tender they will be! 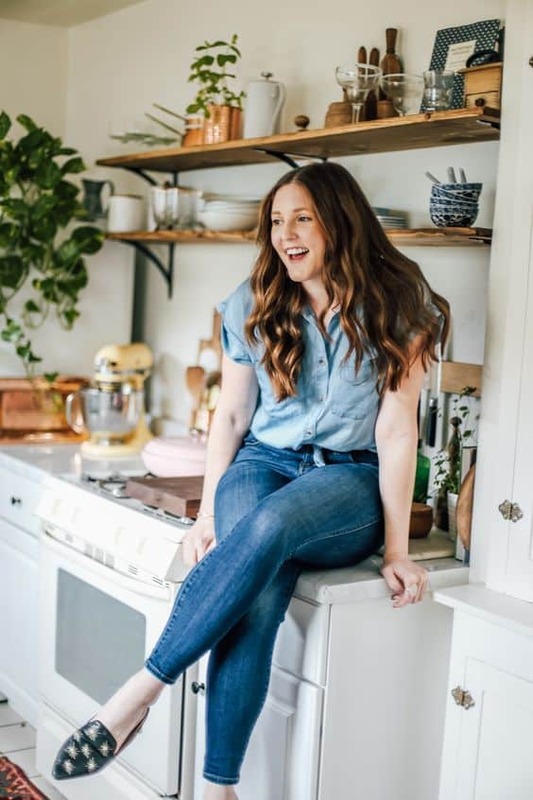 I will be posting fun Easter recipes all week long so stay tuned here and on insta! If you make these luscious guys be sure to tag me @college_housewife! I love seeing all of your fun creations! 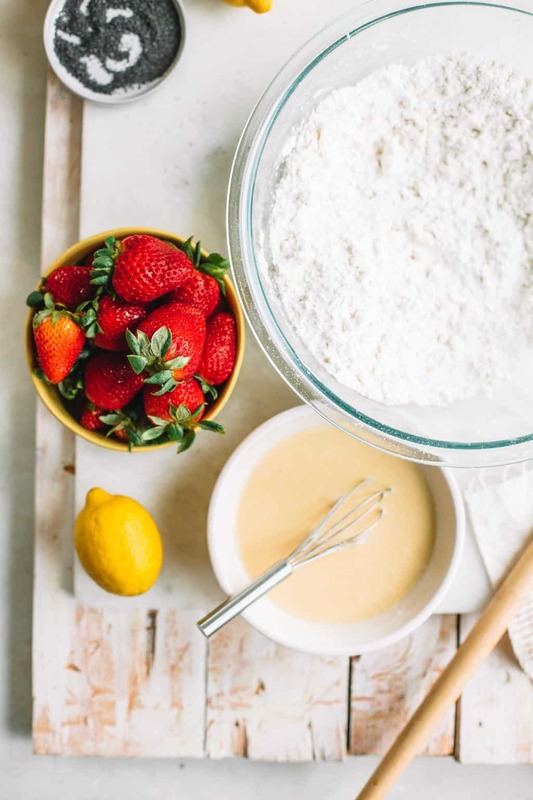 In a medium sized bowl whisk together flour, sugar, baking powder, and salt until well blended. Using a box cheese grater, grate ice cold butter into flour mixture. With a pastry blender or with your hands blend flour mixture and butter together until a course, pea like texture is formed. Very gently fold in strawberries and lemon zest. In a medium bowl, whisk together the cream, eggs and vanilla extract. Gently stir the milk mixture with your flour mixture until just combined. Transfer scone dough to a well floured, cold surface and bring the dough together. Bring the dough together into a disk about 1 inch thick. Cut the disk into 6-8 triangles. Arrange triangles evenly onto parchment lined baking sheet. Brush tops with a light layer of heavy whipping cream. Bake scones for 20-25 minutes or until the tops are just golden brown. 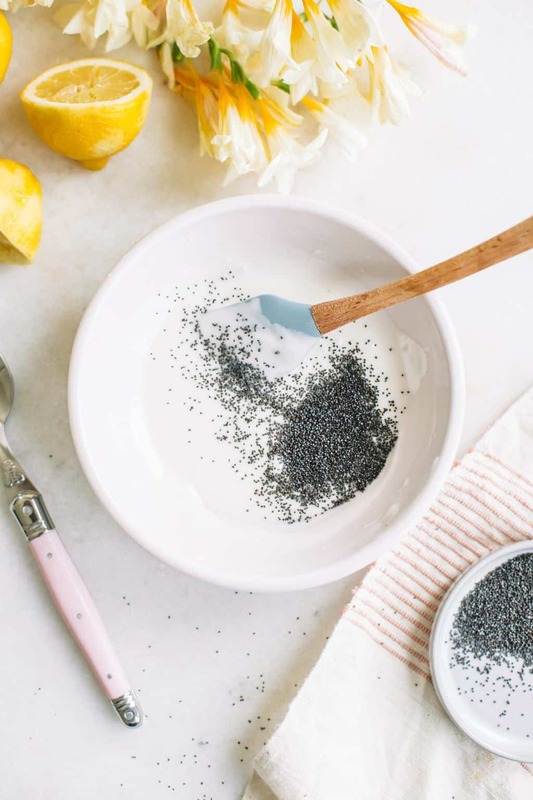 In a small bowls whisk together powdered sugar, poppy seeds, vanilla extract and lemon juice. Add in lemon juice a little at a time until desired consistency is achieved.